The first Indians to perform at the Grammy Museum, these sitar and sarod maestros premier their organic Hindustani blend in Bengaluru on July 29. 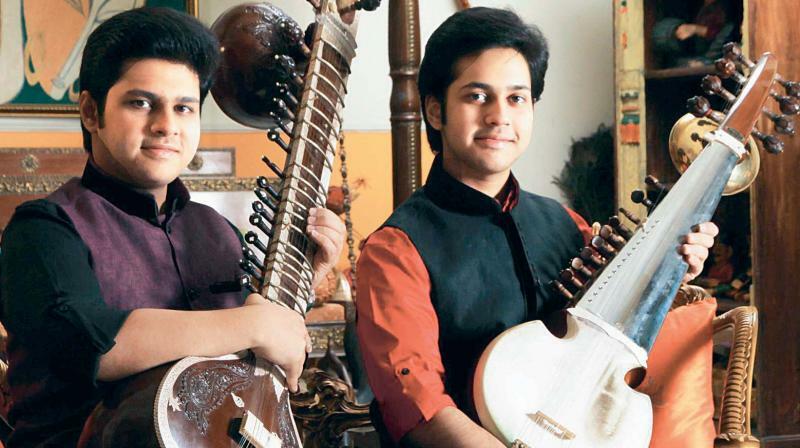 Lakshay and Aayush Mohan Gupta can’t remember a time before Hindustani Classical music. In fact, it was all they listened to growing up, by choice, and what their parents encouraged them to pursue professionally. Although they confess that they argue about picking a raga before every show, the brothers bring about a harmony through the collective sounds of their sitar and sarod. The first Indians to ever be invited to perform in the hallowed halls of the Grammy Museum in Los Angeles, they premier in India what resounded in its walls – The Golden Symphony. This music sojourn will also see a jugalbandi with cello maestro Barry Phillips across the country, and here in Bengaluru at the Chowdiah Memorial Hall on July 29. “For this tour, the two of us are composing a new piece – an organic blend of both classical traditions, although it’s not possible to identify the two genres individually,” say the brothers, who draw influence from artistes such as Pt. Ravi Shankar, Usd. Ali Akbar Khan and Pt. Nikhil Banerjee. Attracted to the Maihar style of playing, they quickly took up the sitar and sarod – both flagship instruments of this Gharana. “Initially, we both began on the sitar, but Aayush always had a fascination for the sarod’s deep and majestic sound,” reveals Lakshay. So far, they’ve performed at prestigious festivals and venues across the world, including one of the largest and most popular South Indian music festivals in the world – the Thyagaraja Festival in Cleveland, at the Taj Mahotsav in Agra, the Ganga Mahotsav in Varanasi, to name a few. “This is our first concert in Bengaluru and we can’t wait to explore the city,” say the excited, globetrotting siblings. Taking after their amateur sitarist father, both Lakshay and Aayush never saw this as a ‘job’. “Music is an art that allows you to express your inner self through the medium of pure sound, it nurtures your creativity, therefore, we never thought it so,” they explain, reminiscing a time when they were school going kids, waiting for the bell to go off just so they could listen to the CDs in the car. Over the years, they tell us that they’ve realised that the real joy is to find what you connect to the most and follow it. “In other words, to be able to make it a way of your life,” says Aayush, who also finds his passions rested in painting, creative design, mastering audio and reveling in history and archeology, while his brother can’t get enough of cars and new cuisines. Their sound doesn’t end at being nominated for the Best Classical Album at the Global Indian Music Awards 2016 for their The Hidden Harmony. They are looking forward to touring North America next. “Before that, we’ll be finalising on our album Malhars, ragas for the rainy season,” they conclude, on one note.